The Viper GT is the most incredibly versatile wheelchair and is easier to propel or transport than an average weight chair. The Viper GT is the best wheelchair that we offer. 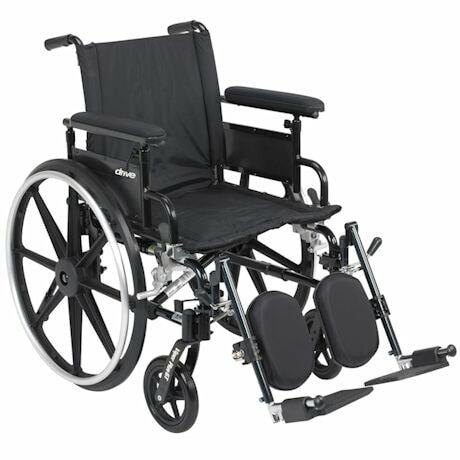 It comes standard with adjustable padded arms, multiple seat to floor height positions, push to lock wheel locks and adjustable anti-tippers with flip-up wheels (which never have to be removed). The back is both angle adjustable and height adjustable to provide added patient comfort. The Viper GT comes standard with a seat rail extension kit that increases the front to back dimensions of the seat. The all-aluminum frame is high strength while remaining lightweight. The wheelchair upholstery is durable nylon which is flame retardant and resists mildew and bacteria. Precision sealed wheel bearings in front and rear ensure long lasting performance and reliability. The quick release, 24" composite Mag-style wheels are lightweight and maintenance free. Tool free adjustable swing away footrests also feature easy-to-access release handles. Urethane rear tires and casters offer superior performance with a smoother ride while remaining lightweight. Ships directly from manufacturer.